We have just finished show casing our new collection at the Colombo Fashion week 2013. ‘Kurunegala Rive-Gauche’. Super Model Perin Fernando wore our final showstopper piece which was 100% hand made with ‘Cheetha’ recycled cut of pieces. This dress took 2 1/2 weeks to finish. It was just made for her, perfectly fitted and showed the real valuve of the dress. She was the best person to carry it and we are so proud to present a dress made with Sri Lankan traditional ‘Cheetha’ textile on a Sri Lankan super model. Thank you so much Perin! 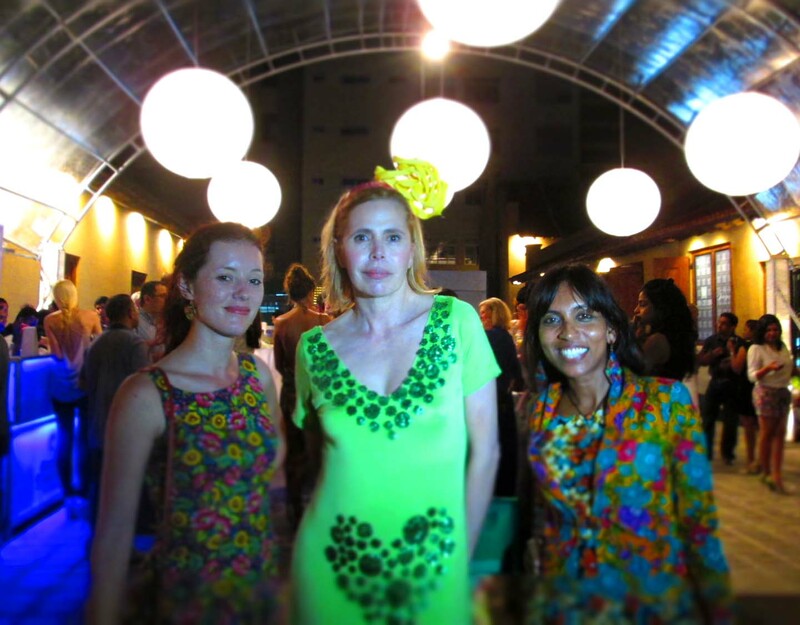 We finally met with Agatha Ruiz de la Prada and had time to talk in Colombo. We missed her in Madrid and we met her in the street of Lyon at the Fête des lumières. It was so nice to keep bumping in to her and finally to talk! super great! DENETH with Nishantha De Gruiter, suitsupply, USA. 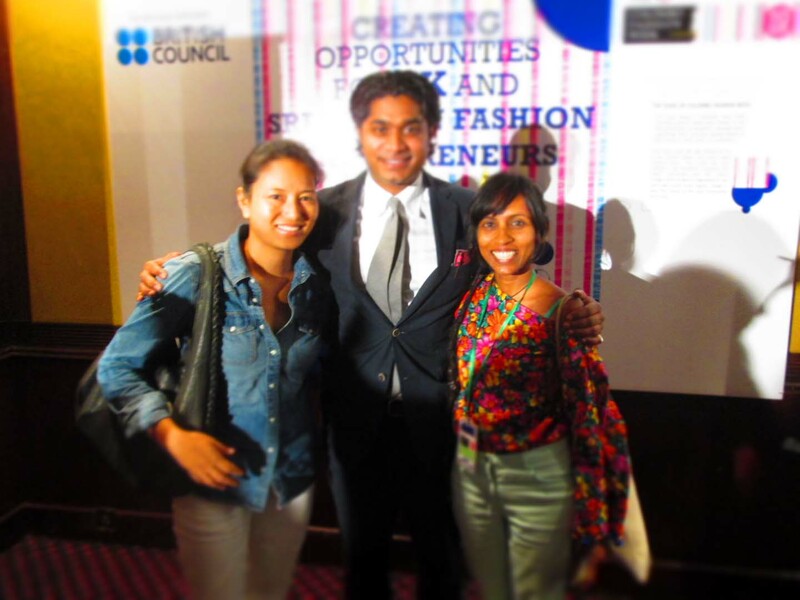 We met the designer/founder Nish from ‘SuitSupply’, USA at the workshop organized by British Council during the CFW 2013. we liked his spirit and enargy! it was great to discover Nish! Colombo Fashion Week 2012 was an interesting experiance. 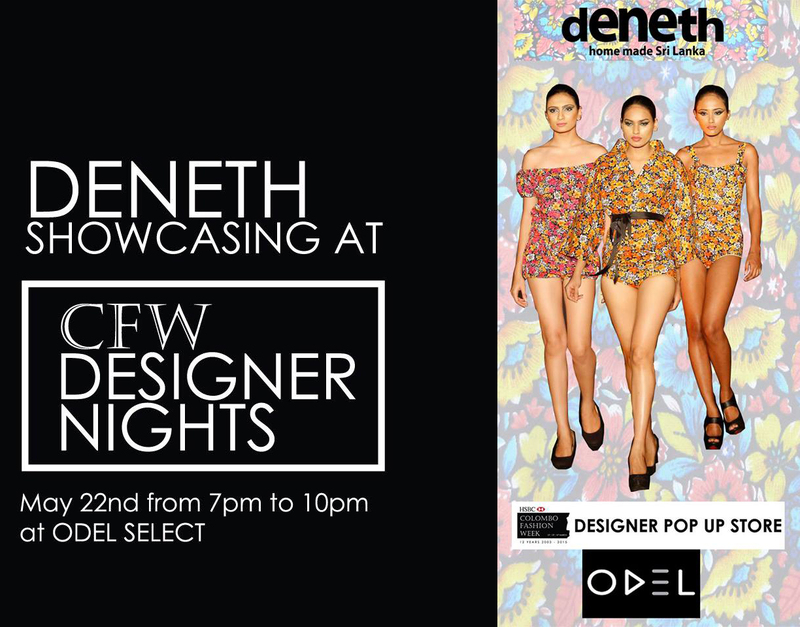 Participating 1st time with many other Sri Lankan fashion designers, Learning and finding the difference of DENETH brand among wider audiance and wide range of designers. It encouraged me to work harder. 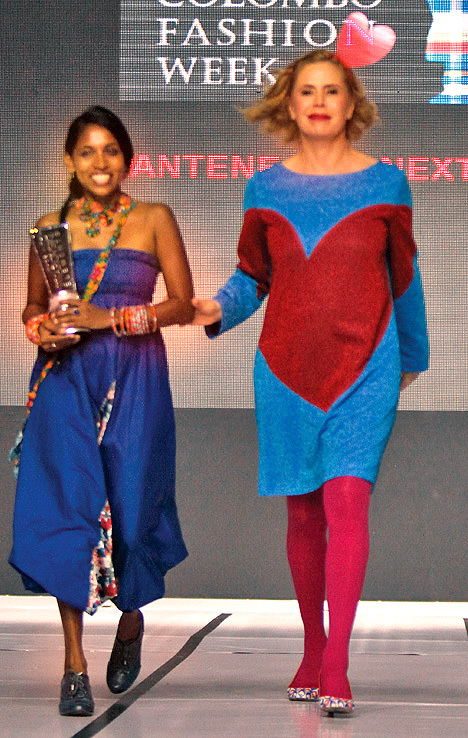 On the 3rd day at the CFW I won the award ‘Generation Next’ after competing with six other designers. I had no clue that we have been judged. It was a surprice and full of happiness to receive the award from Agatha Ruiz de la Prada from Spain. This collection was inspired by Beatles Song and My mom’s 20’s times. I found the perfect colors ‘cheetha’ and perfect models, Anithra and Ravi, to do the shoot. big thanks goes to my dear CoCA friends Suda Sanmugaraja and Lekha Edirisinger for the amazing photographs! the collection is available at ‘Melache’ – Duplication Road, Colombo 04, Sri Lanka.